Consisting of tobacco cultivated in a region known as Bragança located deep in the Amazon Rainforest, CAO Amazon Basin is considered one of the most unique cigars produced this year. These hand-rolled premium cigars are organically grown in undisturbed tropical soil harvested only once every three years. After six months of natural fermentation, the tobacco is transported out of the forest to the mainland by canoe, then taken directly to the CAO factory in Esteli, Nicaragua. CAO Amazon Basin are blended with 4 diverse leaves, dark in color and robust in flavor, perfect for every cigar connoisseur who loves a full-flavored, medium-bodied smoke. CAO Amazon Basin and Amazon Anaconda premium cigars come in Toro size 6” x 52, the CAO Fuma Em Corda are offered in the Robusto size 5” x 50. Being a limited release, these handmade cigars are sure to sell fast. 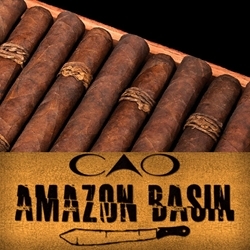 Smokers Discounts offers the perfect way to unwind with CAO Amazon Basin premium cigars. Every cigar purchased on our online cigar store can be delivered right to your front doorstep. We’ve made it easy and affordable to buy hand-rolled cigars. A variety of sizes and flavors are listed below, each of these styles are in stock and available for a low discount price! Call us for more details!